Gaza terrorists continued their attacks over the Sabbath, hitting southern Israel dozens of times. Gaza terrorists continued to fire on Israel over the Sabbath. The Iron Dome rocket defense system successfully shot down 5 rockets, but more than 20 hit southern communities. One rocket hit a factory in the Sha’ar Hanegev region. A worker was moderately wounded. Another rocket hit a school in Sderot, causing damage to the building. School was not in session, and no injuries were reported. 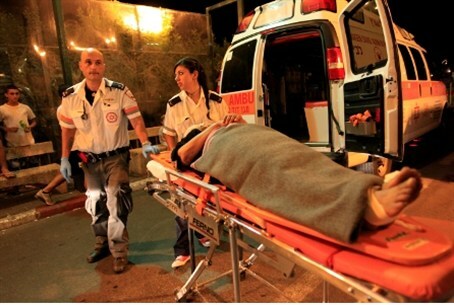 Israeli warplanes fired on a terrorist as he prepared to launch a rocket. Pilots reported a hit. Sources in Gaza confirmed that the man was killed. Prime Minister Binyamin Netanyahu met with Defense Minister Ehud Barak, IDF Chief of Staff Benny Gantz, and other senior defense officials to discuss the situation. He ordered them to take strong action to restore security to the south.